His birth and death records are from a family Bible and confirmed by his death certificate.1 He married Julia Ann Ellen Stewart in DeKalb County, Alabama on 5 November 1882 (see Stewart pages). They apparently moved to back and forth between Alabama and Texas for a while. They must have settled initially in Texas in the mid-1880s, for a child was born there in March 1886 according to later records. A daughter was born in Alabama in 1889 but a son was born in Texas in 1892, then two other children were born in 1894 and 1896 in Alabama, indicating that they returned to Alabama before settling permanently in Texas. By 1900, they had permanently returned to Texas where the family was enumerated in the Morris County census living next door to his parents. My grandmother, the wife of one of their children, told me that she thought the family arrived in Texas about 1885. She did not mention a temporary return to Alabama. My mother told me that Wilson Taylor and his brother James Taylor were briefly in Oklahoma when they fell upon lean times, but returned to Titus County within a year or two. This was apparently shortly after their appearance in the 1900 Texas census, because she heard the story from her father, who said he was a small child at the time. I would note that their brothers John J. Taylor and William A. Taylor were both in Oklahoma for the 1900 census, so that story may be true. Here’s a photo of Wilson Taylor and his wife Ellen Stewart, apparently taken in Omaha sometime in the early 1900s. Click on the thumbnail for the full-size photo. The 1900 census shows Wilson Taylor and Ellen living in Morris County next door to his parents. Ellen is listed as the mother of seven children, six of whom were living and all of whom were in the household. In 1910, the family was living in Omaha, Morris County with all their children still at home. Ellen, who was identified as “Julia A.”, is listed as having borne 12 children, 8 of whom were living, which precisely matches my grandmother’s records. In 1920, they were in Titus County, living on the “Road to Cook Farm”, with Ruby, Opal, and Charlie still in the household. I did not find them in the 1930 census. Ellen Taylor died in 1926 and is buried in Omaha’s Concord Cemetery. On 29 April 1929 Wilson Taylor married 47-year old Mary Susan (Williams) Hill, the widow of Robert Newton Hill, who had died in 1927 leaving Mary with several children. A minister friend, James Chaddix, performed the ceremony. The 1930 census shows Wilson Taylor and Mary, along with her five youngest children, living in Omaha. Wilson Taylor died at the age of 75 on 24 November 1938 in Omaha, Texas and was buried in the Concord Cemetery the following day. The death certificate lists the cause of death as “acute hyperemia of lungs” complicated by asthma. The informant was my grandfather Wilson Van Buren Taylor, who listed his father’s father as “W. A. Taylor” and his mother’s maiden name as “unknown”. He listed Wilson Taylor’s wife as Ellen, with no mention of Mary Williams Hill Taylor. Mary reverted to using the surname Hill when she was enumerated in the 1940 census with her two youngest children. She died in 1952, evidently estranged from the Taylor family. Her gravestone in Morris County’s County Line Cemetery, apparently erected by her children, identifies her as Mary Sue Hill. Amanda Rosella Taylor (17 March 1884 – 9 May 1908) She is listed in the 1900 census as “Rose E.” and in her marriage record as “Rozzellar”. 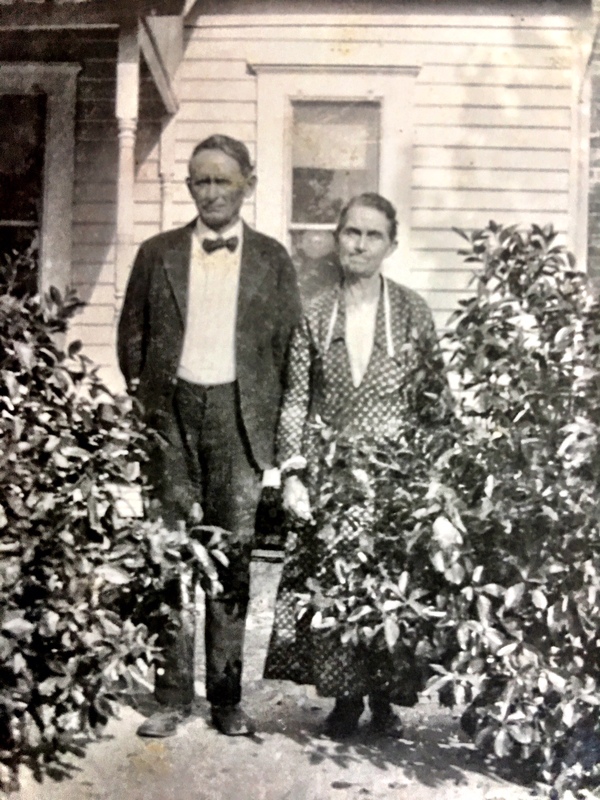 She married Thomas Oscar Driggers on 29 June 1902 in Titus County, but died a few years later in 1908 after bearing two children named Gladys Driggers and Thaddeus Driggers. Florence Margaret Bethany Taylor (12 March 1886 – 9 May 1953) The 1900 census lists her as Florence, which is how she was known, but the 1910 census lists her as “Margrette”. (She was still unmarried at 24 in 1910, and working as a clerk in a dry goods store in Omaha according to the census.) Her full name comes from my grandmother’s records, though her death certificate lists her as “Margret Florence”. She married John Robert Heard (1890-1959) on 11 October 1914 (1913, according to Passie Taylor.) The 1920 census of Omaha shows them with a son named Lester and the 1930 census added a daughter named Velma. The 1940 census showed them with Lester W. Heard (24) and Velma E. Heard (18) still at home. William Walker Taylor (August 1888 – August 1888) He died in infancy. Lillie Mae Taylor (13 October 1889 – 21 January 1978) She was born while her parents were still in Alabama according to her death certificate and census records. She married James Alford Russell on 26 March 1911. They were childless in 1920 but by 1930 had a daughter Mary Pauline Russell (born c1922) and a son James F. Russell (born 1924). They remained in Omaha where she was buried in the Omaha cemetery. Her death certificate lists her parents as Wilson Taylor and Ellen Stewart, and lists the cause of death as myocardial infarction. Samuel Byron Taylor (4 February 1892 – 11 March 1931) Passie Taylor’s records showed his middle name as “Byron” but Passie’s husband was the informant on Samuel’s death certificate that showed his name as “Samuel Barn Taylor”. He married Lizzie Joyner on 5 February 1912. They are in the 1920 Morris County census with a daughter named Mattie L. Taylor (Madeline, according to my mother.) I have a 1927 photo showing Sam B. Taylor and his wife, and his sister Opal Taylor, in the Omaha Cafe.6 The accompanying article says Sam Taylor operated both a blacksmith shop and the Omaha Café, employing his sister there. The menu, readable in the photo, includes a 35¢ steak. He died of influenza complications just past his 39th birthday on 11 March 1931 and was buried in the Omaha Cemetery the following day. The attending physician was my great-grandfather E. Y. Anthony. The death certificate lists his birthplace as Texas and his parents as Wilson Taylor and Ellen Stewart. Wilson VanBuren Taylor (19 April 1894 – 10 January 1965) He married Passie Louisa Witt on 30 March 1918. In the 1920 census, they were enumerated in Cookville, Titus County with his occupation listed as store clerk in a “confectionary”. In the 1930 census, they are listed in Naples, Morris County (as “W. Van Taylor”) living across from the railroad station. His occupation was manager of a grocery store, and the monthly rent of their house is given as $15. By 1940 they were living on a small farm on the Daingerfield Road outside Omaha, where he operated a grocery store. Van died of heart disease on 10 January 1965 and was buried in the Omaha Cemetery two days later. Dovie Leona Taylor (27 March 1896 – 18 May 1965) She is listed in the 1900 census as “Dovie L.” She married James Monroe Lewis in Titus County on 28 November 1918. They are enumerated in the 1920 census in Omaha with no children, his occupation listed as “U. S. Mail”. (A sister-in-law of James Lewis is also in the household, along with Dovie’s niece Gladys Driggers.) James M. Lewis was enumerated as a Methodist minister in San Saba County in 1930 and in Menard County in 1940. Those censuses list two daughters named Rachel M. Lewis (who was adopted) and Mary Beth Lewis. Dovie died in Dallas according to Texas death records but was buried in the Omaha Cemetery. Pearl Taylor (9 October 1900 – 9 October 1901) Died in infancy. Ruby Esther Taylor (18 May 1901 – 11 March 1983) She married David Flemming Hall (1900-1953) according to Passie Taylor. The 1930 census shows David Hall and his wife Ruby E. (listed as age 27) living in Cherokee County, Texas next door to her sister Opal and her husband. The 1940 census shows them back in Morris County with children Glyndeen Hall and Billie Wayne Hall. Ruby and David are both buried in the Bradfield Chapel Cemetery, Daingerfield , Texas. Opal Beulah Taylor (13 November 1904 – 1987) She married Herschel W. Harris [sometimes rendered as Hershell] about 1929. They are listed next door to her sister Ruby in 1930 in Cherokee County. They returned to Morris County by the 1940 census where they were enumerated with two daughters named Patsy V. Harris and Bettie H. Harris. The couple ran a gas station and store in Omaha according to my mother. Opal is buried in the Omaha Cemetery. In the 1930 census, Charles Taylor was enumerated as a farmer in Hopkins County with Katie, a stepdaughter named Nadine E. Steed (12) and a three-year old son named Charles Edward Taylor. (The son may have been counted twice in the census, the second time as three-year old stepson Charles E. “Steed” in the household of Marcus Steed.) In the 1940 census Charles and Katie were still in Hopkins County but were now listed with Katie’s son Carrol S. Steed (24) and Cletus Watzel Taylor (3). Oddly, Charles E. Taylor (13) was in the 1940 Camp County household of Marcus B. Steed listed as a “stepson”. Though Charles Taylor lived in Talco, Franklin County, he died at the age of 67 of a heart failure in a Mt. Pleasant hospital. Charlesy Taylor (18 June 1907 – 17 August 1907) A twin of Charles died in infancy. She was named Charlesy, according to Cletus Taylor.